I am slowly recovering from something I think was probably one of the hardest things I have done in my life – run 101.6km around the highest mountain in Germany, the Zugspitze, in 23.36.57 (I did take a longÂ time for that distance). 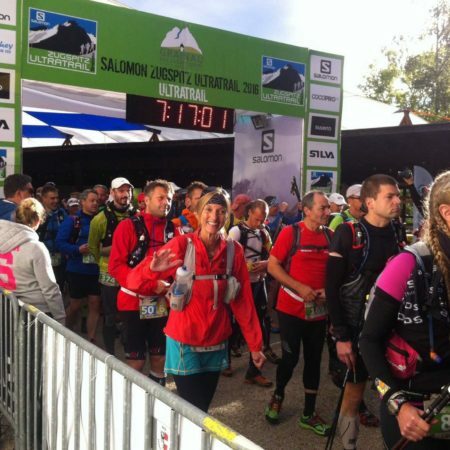 On Saturday, 18th June, I took part in the Zugspitz-Ultratrail, which is an amazing and very strenuous event in my home valley. My training started about 3 months ago and I managed to do a lot of long runs alongÂ the hills surroundingÂ the Kathmandu valley with my friend Jo, however, the longest I ever ran was about 50km in the Stupa-to-Stupa run, which was organised by Trail Running Nepal and leads from Swayamunath Temple to Boudha Stupa. After that race I felt fine and I was convinced thatÂ I could go on for another few kilometres. However, running 100km across mountains in atrocious and cold weather with a lot of rain (fortunately no leeches) isÂ a different story and takes a huge toll on your body – something I have never experienced.Â I am sitting here writing this two days after the run and my body is still puffed up, I guess there is a lot of water retention, I still feel tired and I don’t even feel like going for a run. Well, I have been told by my ultra runner friend Lizzy Hawker that I must not run for one week. It still boggles my mind how Lizzy can run the 320km from Everest Base Camp back to Kathmandu in 63 hours and 8 minutes. Anyway, for me 101.6km was plenty and I don’t think I would like to attempt a run any longer than that. The race started in the small Alpine village of Grainau, which is nestled at the foot of the Zugspitze. I was very lucky that my friend Elke had come to Garmisch to take me to the start as it meant a lot to me to have that support. Fortunately it was not raining in the morning and even though it was far too cold for this time of year, the sun came through and it seemed to be a good day. Waving my friend Elke goodbye at the start. 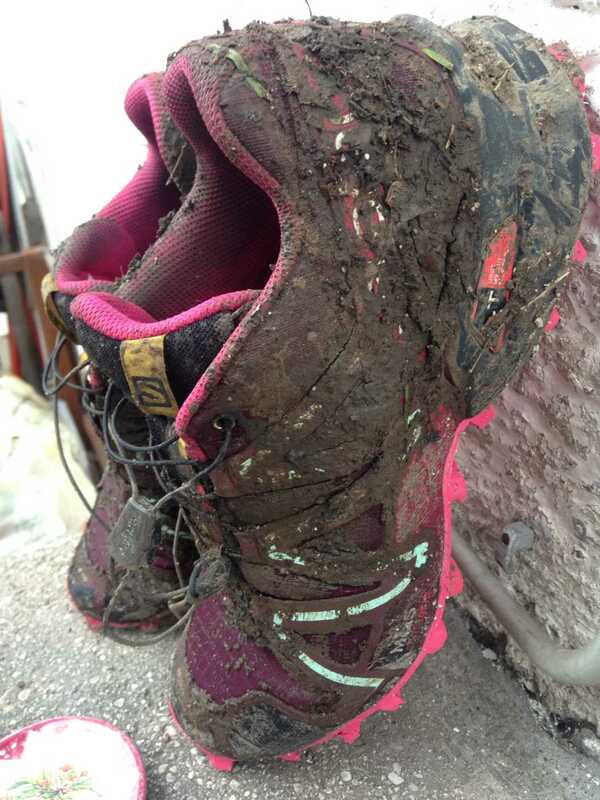 The first 20km felt fine – there was a lot of walking involved as the route went via small and very muddy trails and some of the creek crossing caused traffic jams. Ah yes, the mud was ubiquitous on this run as central Europe has seen a pretty bad summer so far with lots and lots of rain. When I got to the first checkÂ point I felt fine andÂ full of energy.Â I had a drink and a chat to my friend Evi, who was one of the amazing people whoÂ supplied the crazy runners with food and drink, and carried on to Austria. 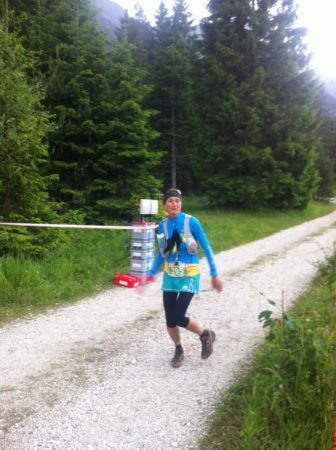 The next stage took us toÂ the Scharnitz Joch, which at 2,048m was the highest point of the race. Up here, we were greeted by wind and snow and I was very impressed by all the volunteers, who were up on the col making sure all the runners were ok. It must have been freezing to stand around all day long. Going down took us across a big snow field, where the mountain rangers had fixed a rope for an easy descent. Fortunately I know how to arm-rap, which definitely madeÂ descending a pretty quick affair for me. 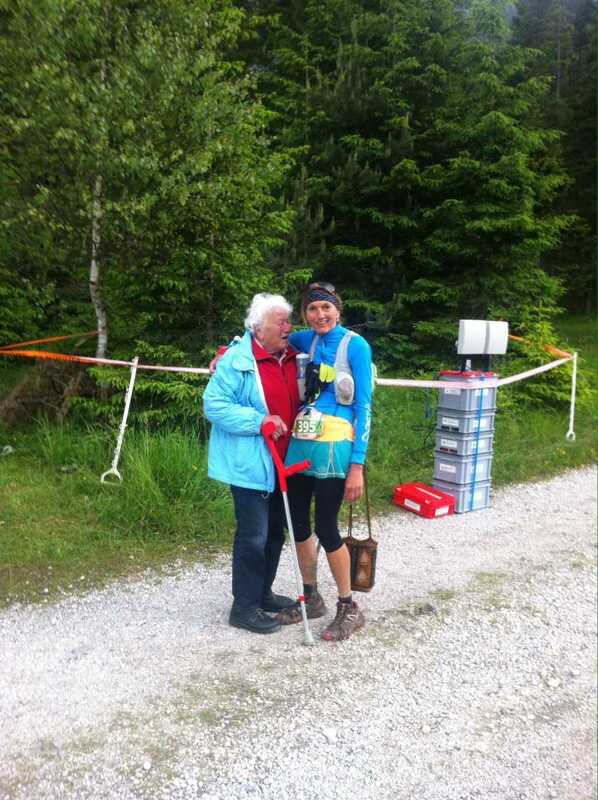 The next check point was after about 50km down at the bottom in Leutasch/Austria and when I arrived there I was extremely pleased to see my friend Elke again, who shouted: “I have brought someone for you.” And then my mum came out of the woodworks and gave me a bigÂ hug. This was a very touching moment and meant a lot to me as it is not a matter of course that your family and friends give you so much support for such a crazy mission. It was soo special to see my mum at the checkpoint in Leutasch. After I had had a quick drink and some food and bid my supporters goodbye, I continued back into Germany….and this is where it started to become more difficult. I had been running for about 12 hours, it had startedÂ toÂ rain, the route was partially on the road and my legs were feeling heavy. But hey, it was only another 51.6km 😉 – just a little bit farther than a marathon! And at about kilometre 60 I guess I hit the wall properly. It was chucking it down with rain, I was soakedÂ down to my bones, it was dark and I had the dooming task to climb about 1,000m up to the Osterfelderkopf, which at the time I was not aware of as I had not looked at the route properly beforehandÂ as I had preferred to run into the unknown. Still feeling great and enjoying it after 50km! On my way to the 8th checkpoint at about kilometre 80 I met Herbert from Austria, who took mercy and stuck with me untilÂ the end of the race. Thank you so much Herbert as I don’t think I would have made it without hisÂ support! We managed to zigzag our way up to the Osterfelderkopf, which was hard given the fact that we had to climb up to about 2,000m at 4am after having run/walked for 21 hours and it was 4 o’clock in the morning. Mind you, the winner of the race Thomas Farbmacher from Austria had long been in bed by then as he finished it in 11.41.07! And so had the fastestÂ woman, Kristin Berglund also from Austria, who finished in an impressive 13.21.27. I was shivering going up there but I kept on going, putting one foot in front of the other and I was thinking about my friend Lizzy Hawker, who said: “A 100km race is made up of single steps.” And so it was. 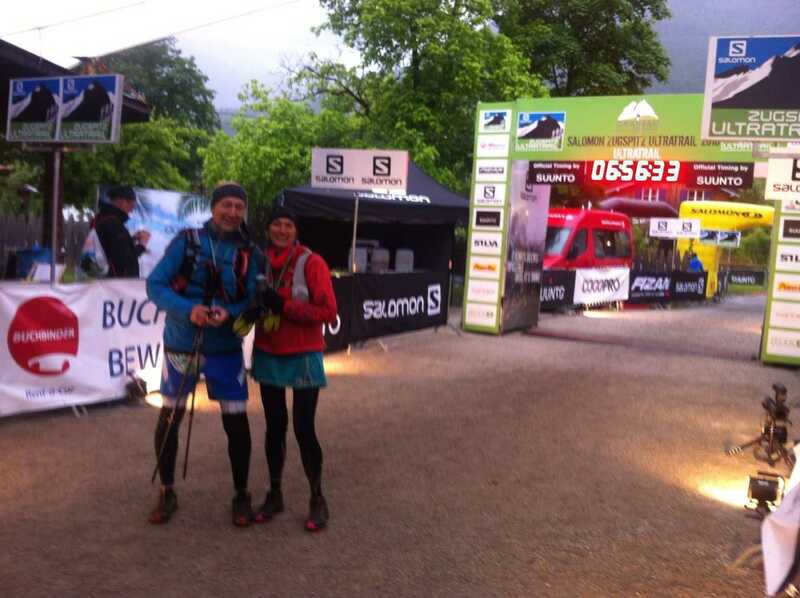 At about 5.30am I was back at the last checkpoint and Herbert, who had done the race four times already, said: “It’s all the way down from here.” He was certainly right, but it was by no means easy. We climbed down the steep Jaegersteig path consisting of bit rocky steps and as I was anticipating to be a lot faster than I was I rang my friend Elke to tell her that I would be there soon. Ha, little did I know. It took me another four hours to get down to the finish line and I remember that I really had to fight off sleep during the descent. Attempting to run across the finishing line. And finally, at 6.55amÂ I crossed the finishing line with more of a limp than a run – but I was there. And so were my friends to welcome me, which was very special. It is quite amazing how emotional you feel after such a long run and I shed a few tears there, had a quick drink, collected my T-shirt and my medal and the only thing I was longing for was a hot bath! Now it is 2 days ago that I finished the race andÂ I can still feel the strain on my body. Running is out of question at the moment and so is any other form of exercise, apart from my Core training which I did yesterday in order to have a good stretch. But I do feel that my poor body needs time to recover and I don’t think I have ever experienced it like this before. 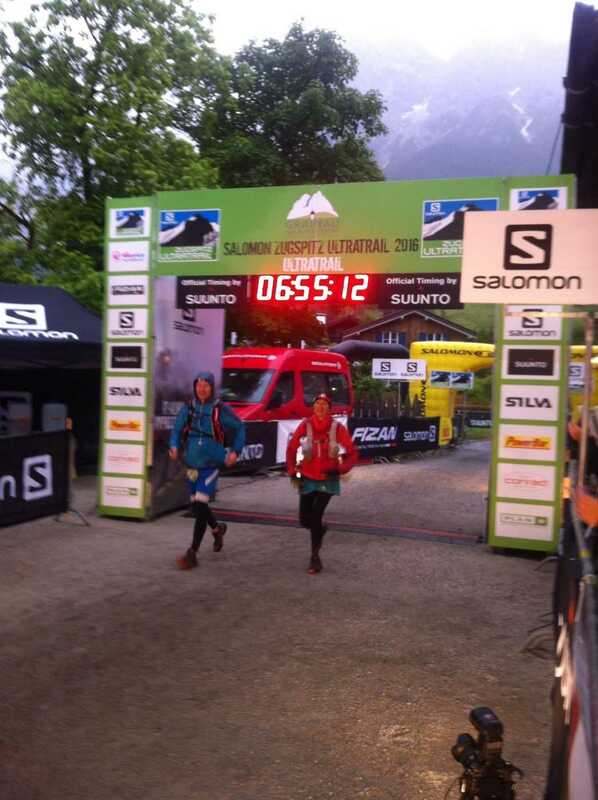 However, despite all the hardship it was an amazing thing to do and I would like to thank the organisers of Zugspitz Ultratrail as well as everyone who was there to volunteer and look after the runners in such atrocious weather. And thank you so much for everyone who encouraged and supported me to do this. It was a very special experience and I am very very happy that I did it (even though slowly) but I don’t think it will ever be repeated again. Dear Billi, meanwhile, are glad that you have finished the race. I had written to you long ago that you could finish the race in a time between 18 and 22 hours. It seems to me that I’m wrong a lot. 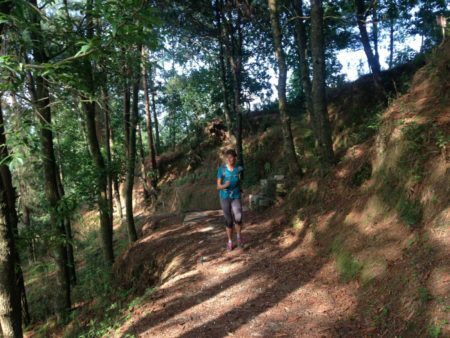 Running 101 km in the mountains involves a great deal of mental and physical energies. You have done well, so be happy.